Please find below and attached details from GCC about the “missing link” on the A417. People across Gloucestershire are being urged to support a campaign to secure funding to sort out the A417 ‘missing link’. The government will set out its future road schemes at the end of March this year and Gloucestershire County Council is today launching a campaign to see the missing link solution – the A417 loop – added to the list. If it is added to the list, there’s a much higher chance of securing the funding needed when the government is allocating cash in spring 2015. Over the next two months, the council needs people to get behind the campaign and support the A417 loop in order to convince the government to stump up the £250million needed. Once this window of opportunity closes, it’s unlikely the chance will come up again for many years to come. Now people across Gloucestershire are being asked to show their support for the A417 loop by signing up and pledging their backing on www.a417missinglink.co.uk. The missing link is a 5km stretch of single carriageway on the A417 trunk road with the remaining route between the M4 at Swindon and M5 at Gloucester being dual carriageway. It is a significant bottleneck and has the worst average vehicle delay of all strategic routes in the South West. The Air Balloon roundabout, which is a key part of the missing link section, is forecasted to be running 30% over capacity by 2026. The route already sees more than 34,000 vehicles a day and in the past 15 years there has been more than 340 casualties following accidents on that stretch of road. The impact on the local economy is also significant with many local businesses affected by unreliable deliveries and lack of confidence in the road network preventing investment. The Highways Agency, which owns the road, has investigated possible solutions and significant work has been done on this over the past 20 years. Following this work, the A417 loop, formerly known as the Brown Route, has been highlighted as the best solution. The A417 loop is a new road made up of a short bypass of Nettleton Bottom, widening of Birdlip Bypass, a new junction at Birdlip, a new junction replacing the Air Balloon roundabout and construction of an additional two lane carriageway down Crickley Hill. The result will be an uninterrupted dual carriageway all the way from the M5 at Gloucester to the M4 at Swindon. The A417 loop follows the existing path as much as possible and has been judged as the most environmentally friendly by the Environment Agency. Other solutions, including a tunnel which would cost £1billion, have been ruled out on cost and environmental grounds. Cllr Hawthorne added: “Now is the time for us to make our case heard. We firmly believe the A417 loop is the way forward and we have to make sure the government hears that message loud and clear. The window of opportunity for securing the cash for the A417 loop is short and we need to show the government that Gloucestershire really is behind this scheme. You can also email us at info@a417missinglink.co.uk. 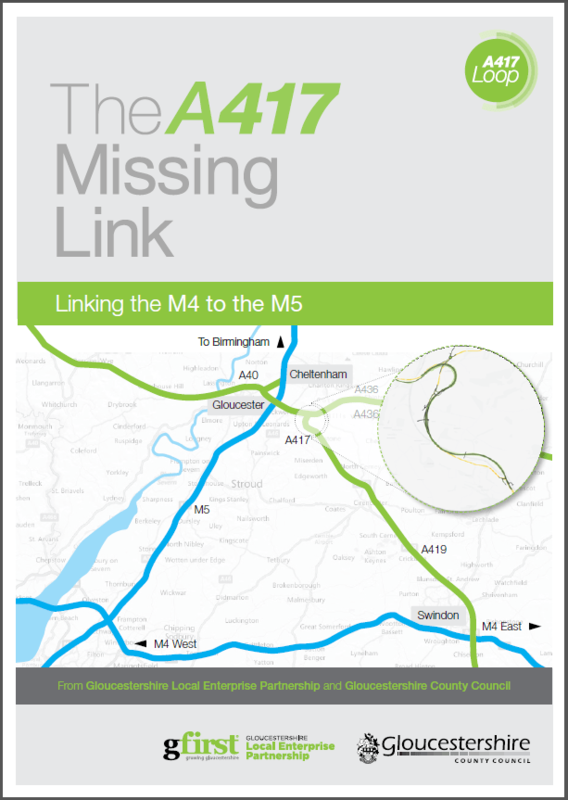 Download the “A417 Missing Link” brochure.